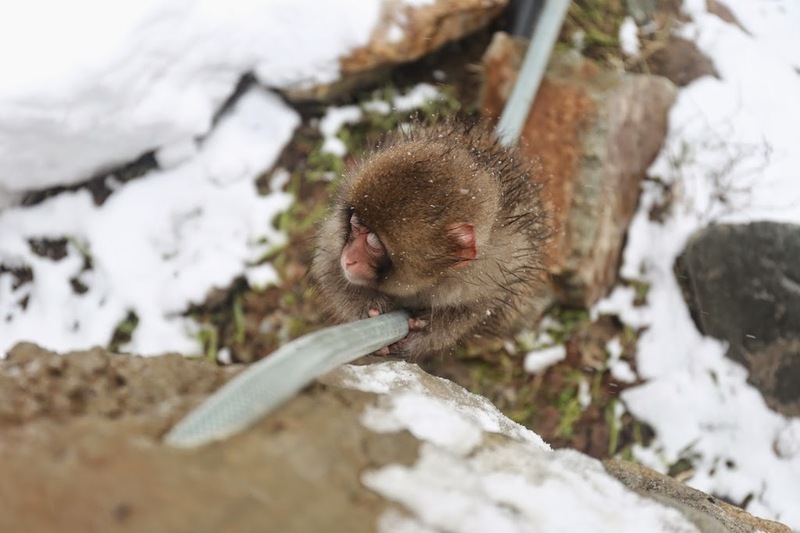 Japanese macaques live mostly in northern part of Japan where temperature is below freezing in winter. These macaques are known as snow monkeys. 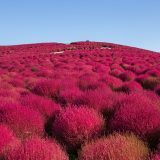 It’s often featured as one of Japan tourist attractions in winter. 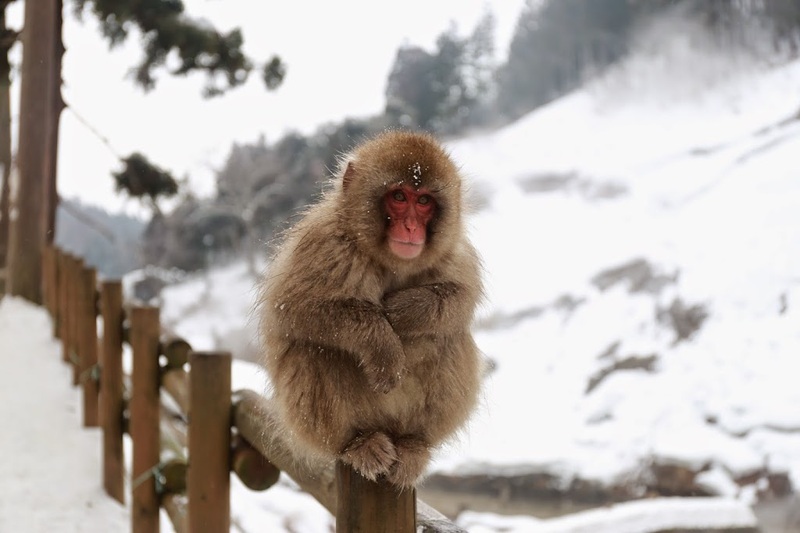 Jigokudani snow monkey Valley is one’s of Japan unique attraction from December to early March. 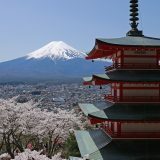 By location, Nagano is not far and can be easily reached from Tokyo. From spring to summer the snow monkeys live in the wood as a family or troop. They know living together as troop is a matter of survival in fierce winter temperature. An alpha dominant male macaque leads the troop moving from one place to another. 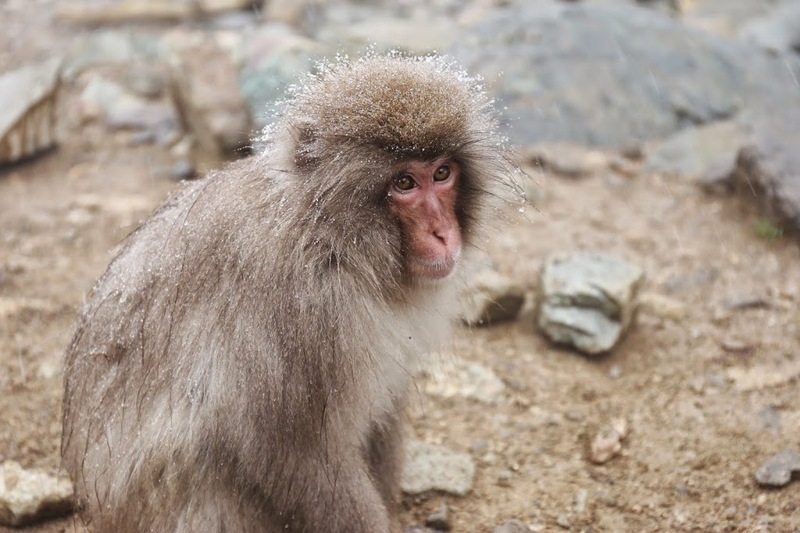 When winter starts, snow begins to pouring down, a troop of snow monkeys moves to the valley where the hot spring is. Keeping up in the troop is vital for survival. 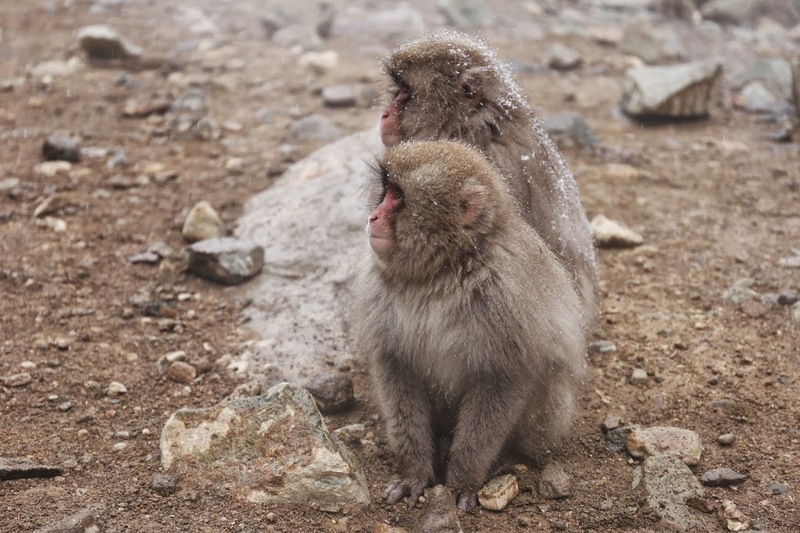 The snow monkeys stay close to each other to warm up themselves before reaching the hot spring. Then they soak and groom each other inside the hot spring. 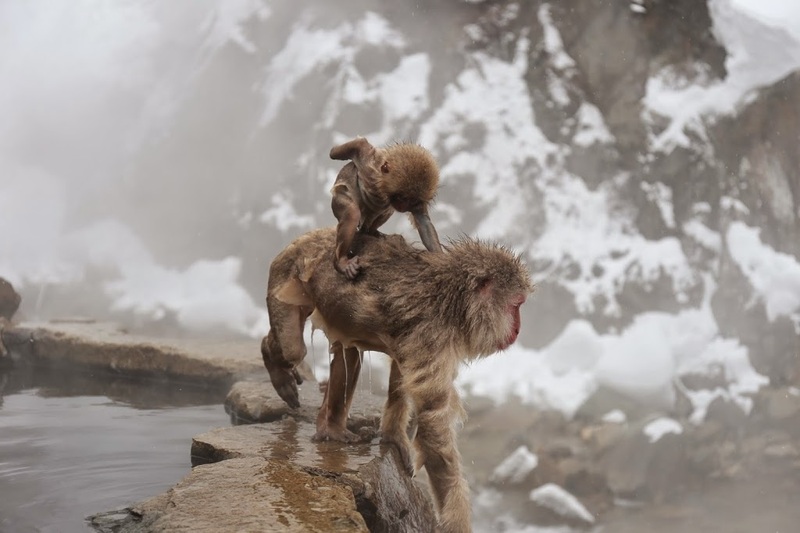 Grooming is very important for the snow monkeys. 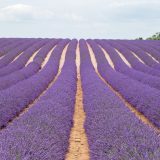 It is not only for meal but also a time to bond and hygiene purpose. 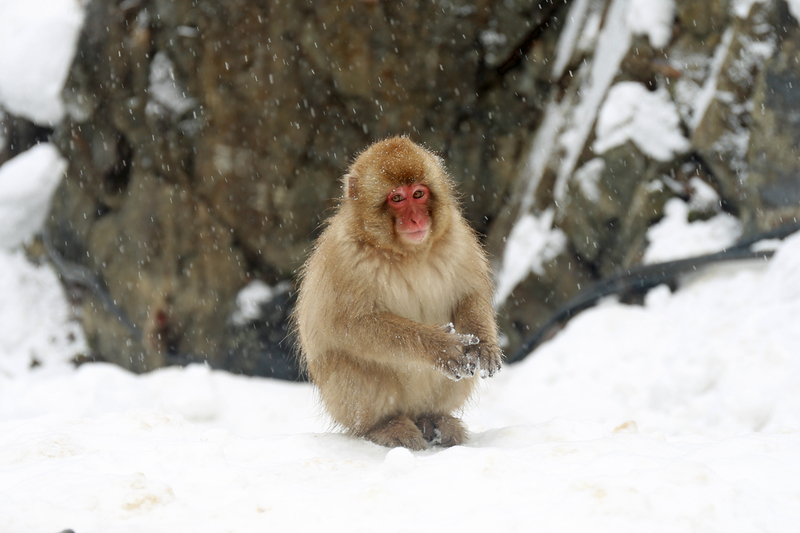 It is said snow monkeys start flocking in the onsen in December when the temperature below 10C. Winter means a time to bond and groom each other. 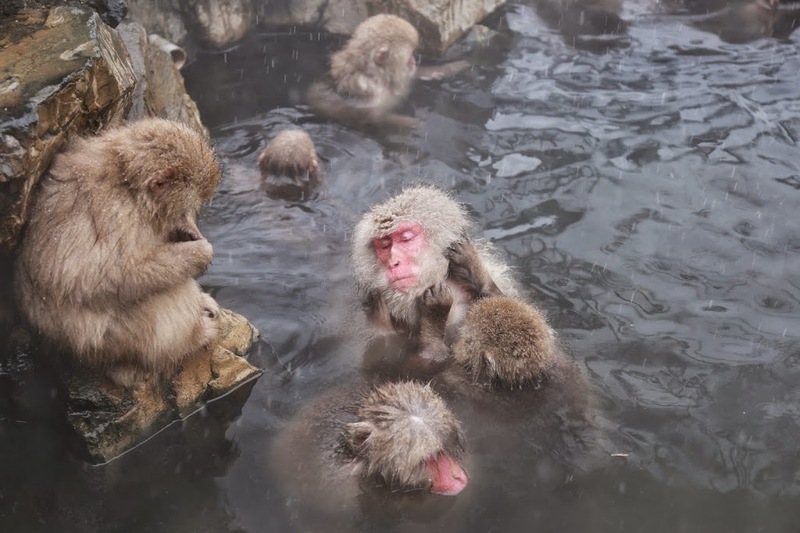 Only female and baby macaques are allowed to enter the onsen (hot spring). The males are watching the female and their baby bathing inside the onsen. 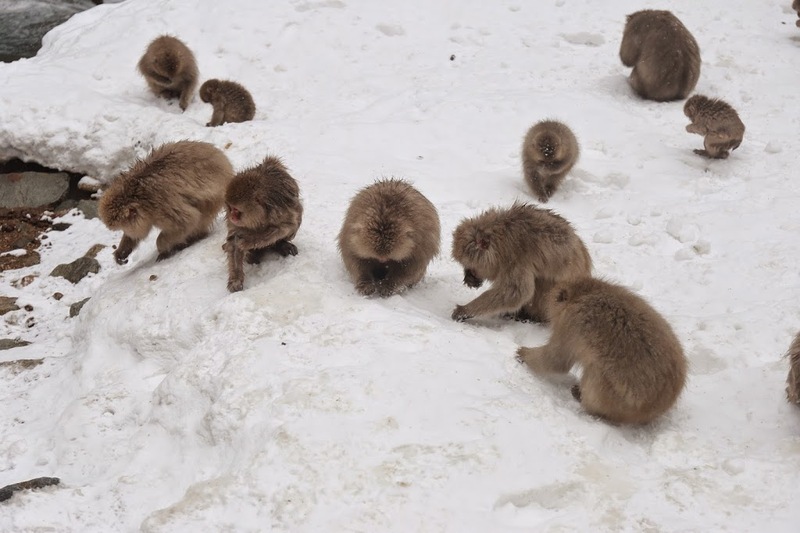 The surrounding area of the onsen is a playing ground for juvenile monkeys. Like this baby monkey was holding the pipe and sliding down from the top of the ground then try to bite it. 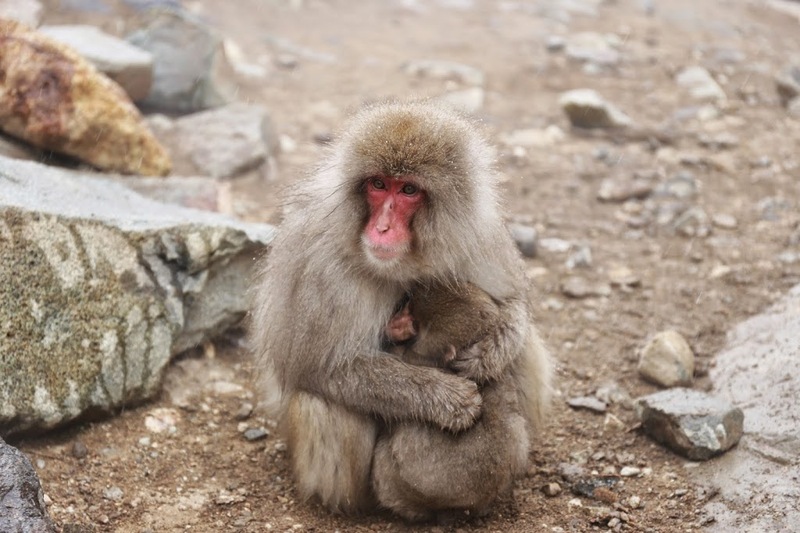 A female macaque always hug her baby to provide warm (for each other). 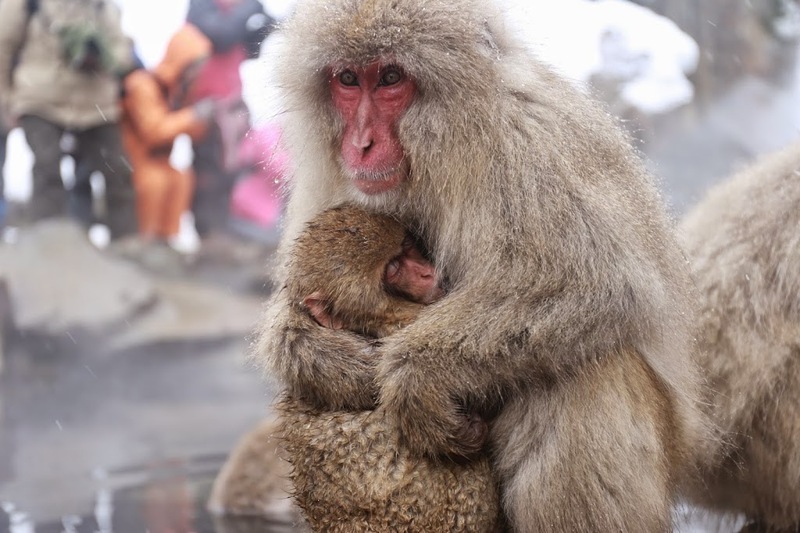 For female macaque keeping the baby warm is always life mission. 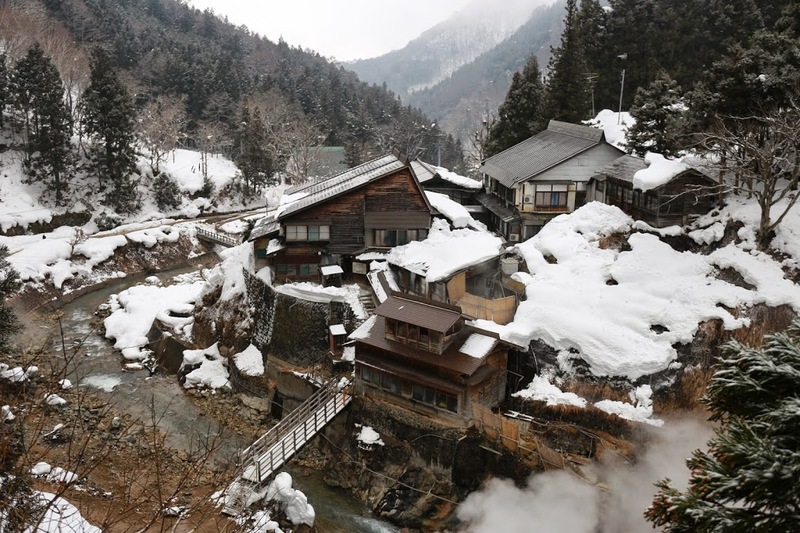 This Jigokudani Hell Valley hot spring and its surrounding is maintained by train and bus company. These macaques are also well taken care of, fed on regular basis. We were there at the feeding time. A man banged a large container of food to let all macaques know that it’s the feeding time. For ten minutes or so the hot spring was almost empty, only two babies macaques left in the hot spring. They probably were too young to understand what the feeding time meant or too excited with the warmth of the hot spring. 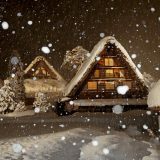 It is said that long time ago snow monkey came out of nowhere taking over this house’s hot spring. Feeling pity for the macaques, the local then built a hot spring nearby this house dedicated to the snow monkey and close the house’s hot spring. 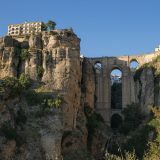 Somehow, some monkeys can still sneak into this hot spring. By bus from Nagano station to Kambayashi onsen bus stop. 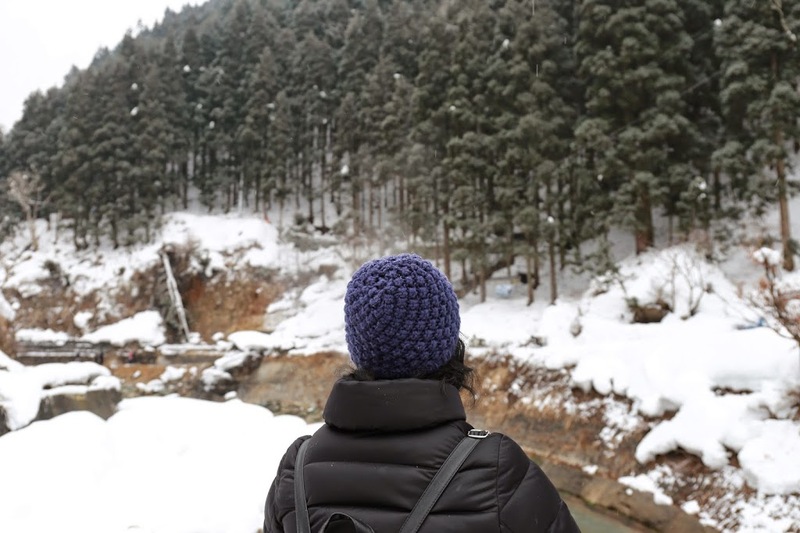 It takes 40 minutes to an hour walk from Kambayashi onsen bus stop to the valley. The bus runs every an hour or so. 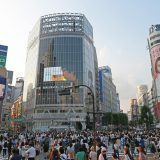 Try to get the bus schedule, plan ahead which bus you plan to take and leave the valley an hour before the bus arrival. The path to the valley is slippery and covered by thick snow. 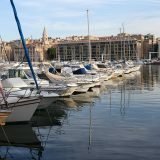 A pair of comfortable snow boot will help you get to the place. Bring umbrella and rain coat, snow can pour down heavily at any time.